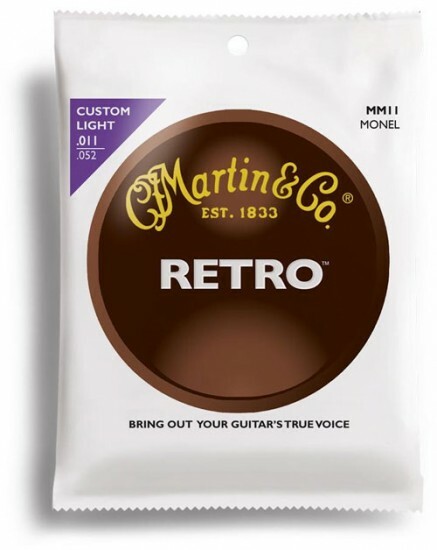 Martin's Retro acoustic guitar strings help bring out your guitar's true voice. The long-lasting strings are made from a proprietary nickel-based alloy blend that quickly mellows to produce a warm, vintage tone. This Custom Light set offers gauges from .011" to .052". Sounds very thin & tiny to me, and removed the nice rosewood overtones of my guitar. I want to thank you for the great and fast service in delivering my strings. This is my first purchase with Strings By Mail and will continue getting strings here. My whole order arrived exactly as stated and in perfect condition.